Total loading capacity: 150 kg. Wheels diameter: Ø 75 mm, two non-rotating and two rotating with brakes. Conditions: Humidity 60% Temp: 25.3 Deg. C.
The cart has on the upper part of the right/front leg a 10mm snap for grounding the cart at the parking station. Six feet grounding coil cord terminated with a banana plug and an alligator clip is included with the cart. The measurements were done as per ESD guidelines. The ATC-1 was not loaded (No load = worse case measurement). 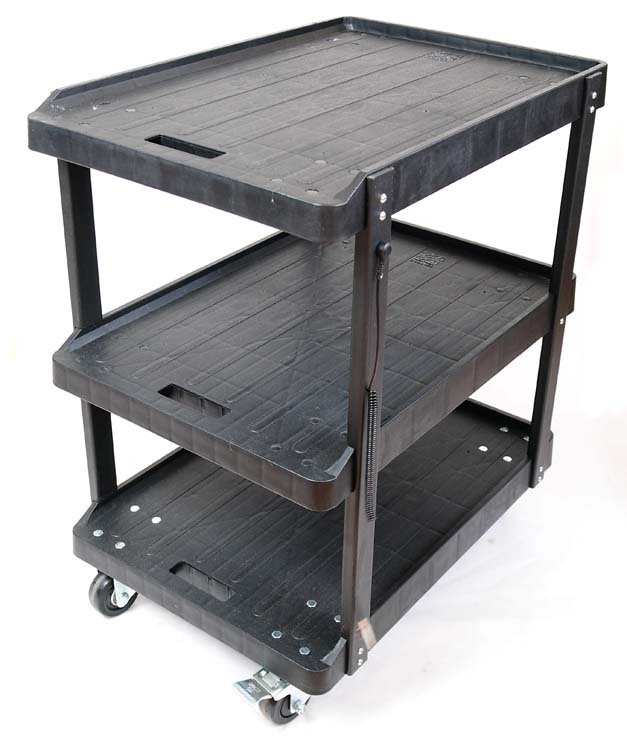 The ESD rubber wheels make better contact with the floor when the cart is loaded. 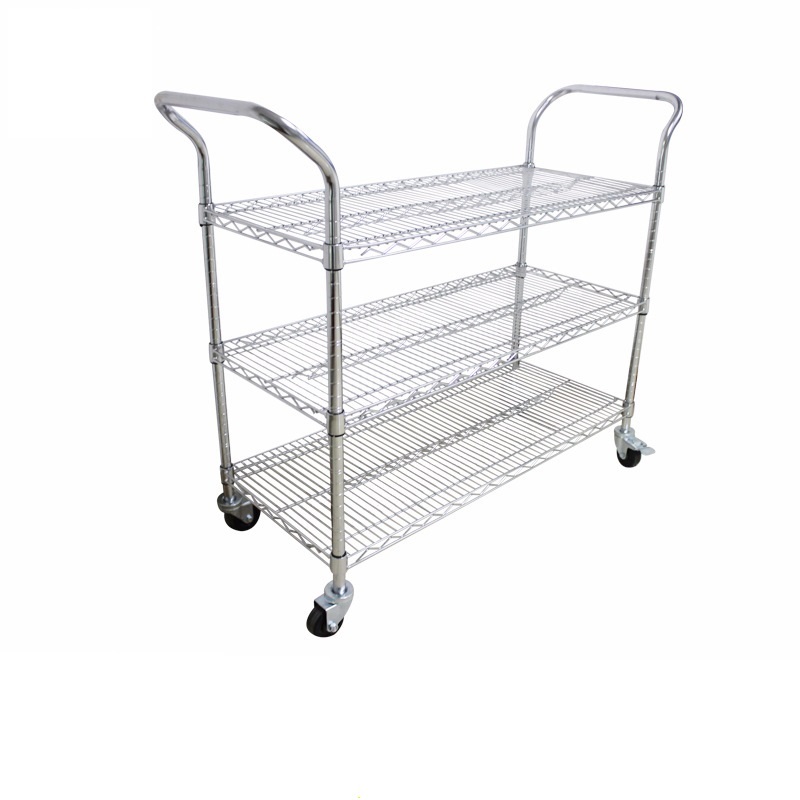 All metal cart with ESD wheels and ESD Rubber mat on the top shelve. 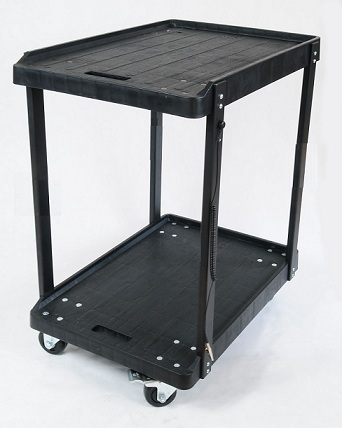 This Utility Cart is designed to prepare and transport equipment, parts etc. to the assembly area. Makes a convenient mobile work surface for sorting parts, quick product repair, packing etc. No burn, rubber mat top makes it soft for transporting delicate parts. Easy to clean and handy. When not in use for transporting, can be used as an extra shelf or table. Convenient handle for pushing or pulling. The cart has a 10mm snap for grounding the cart at the parking station on the upper part of the right/front leg. Six feet grounding coil cord terminated with banana plug and an alligator clip is included with the cart. 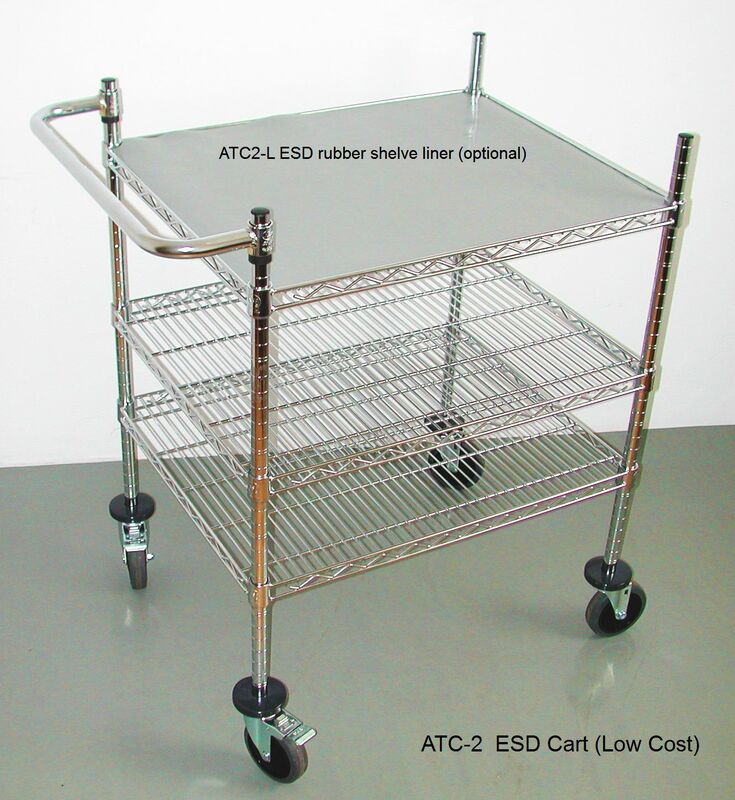 ESD Utility Cart. Conductive, no marking wheels. Top shelve finish: ESD, two layer non burn rubber mat. Model ATR-1M has an extra middle shelf. Otherwise, same performance as ATR-1. 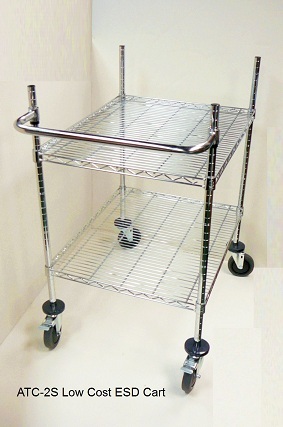 This cart was designed to prepare and transport equipment, parts etc. to the assembly area. 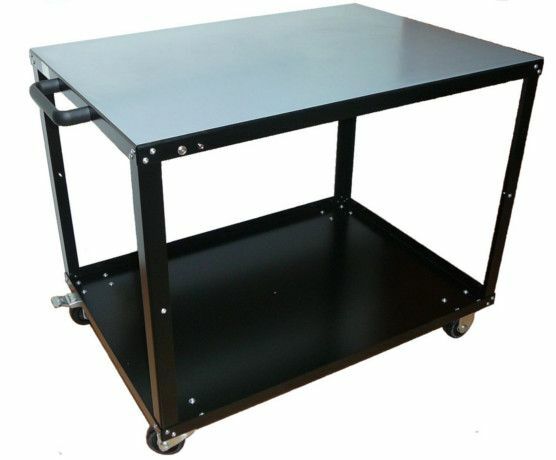 It makes a convenient mobile work surface for folding, sorting or repairs. 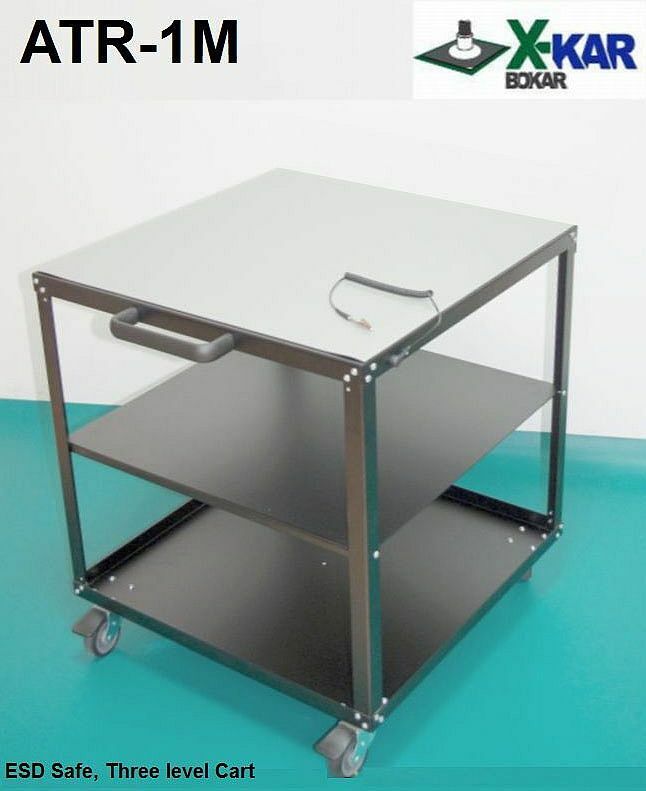 It is also intended for placing on it laboratory equipment which needs to be mobile. Large, non-marking ESD safe casters. 10mm grounding snap on the right side of the top shelf and a grounding coil cord to safely ground the cart at a parking station when used on not ESD safe floors. Top covered with antistatic, two layer rubber mat. Two levels for model ATR-1R. Two rotary wheels. One with brake, on the front. 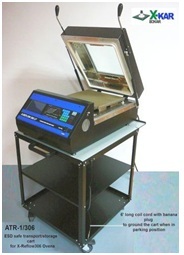 The cart was designed specifically for X-Reflow306 Series Batch Ovens. 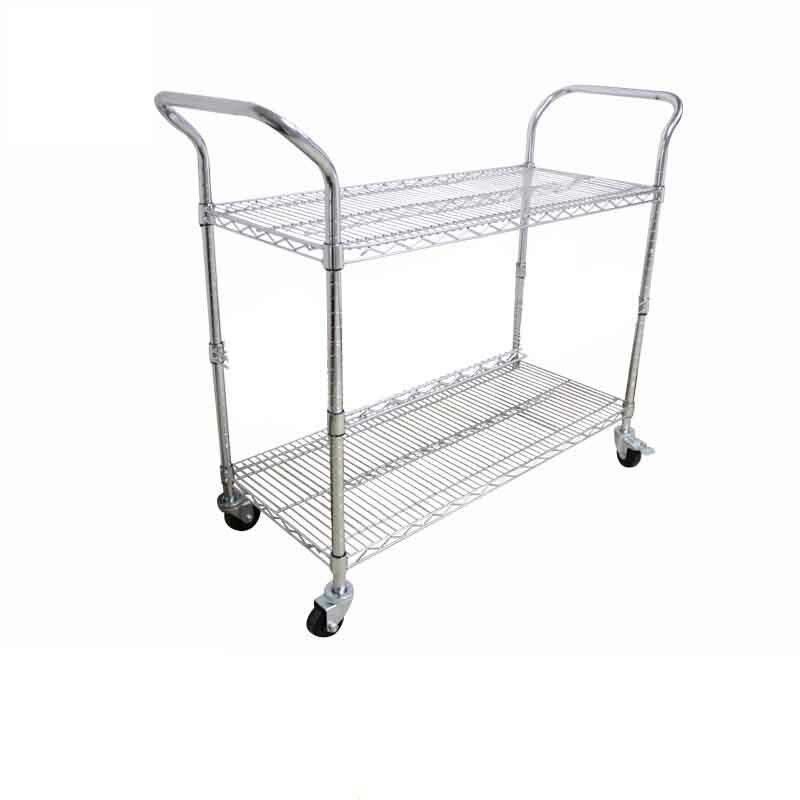 All metal cart with ESD wheels and ESD rubber mat on the top shelveextended to match X-Reflow306 ovens lengths. The middle shelve is spaced the way allowing sufficienthight to place on the cart X306 Fume extract. 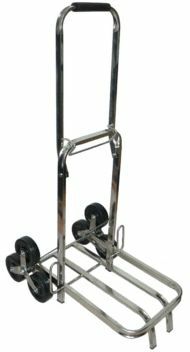 The cart can be used to prepare and transport other equipment, parts etc. to the assembly area. Makes a convenient mobile work surface for sorting parts, quick product repair, packing etc. The cart has on the upper part of the right/front leg a 10mm snap for grounding the cart at the parking station. Six feet grounding coil cord terminated with a banana plug and an alligator clip is included with the cart. Described below metal ESD Carts were designed to minimize the cost. They are all made of steel rods, chromium plated. Shelves connect to the four posts via made of metal, slightly conical split inserts to guarantee good path to the ground via wheels. Conducting wheels on ESD rubber tires guarantee current passage to the ESD safe floor. For transport of small parts the optional ATC-L ESD rubber mat, pre-cut shelve liners are offered to make solid flat surface of desired shelve. Designed to minimize the cost. They are all made of steel rods, chromium plated. Shelves connect to the four posts via made of metal, slightly conical split inserts to guarantee good path to the wheels. Conducting wheels on ESD rubber tires guarantee current passage to the ESD safe floor. For transport of small parts the optional ATC2-L ESD rubber mat, pre-cut shelve liners are offered to make solid flat surface of desired shelve. 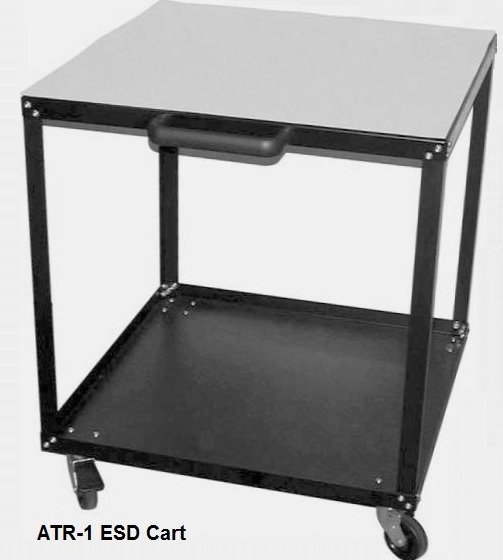 The ATC-3 cart is similar to ATC-2 cart. to facilitate movements in narrow passages. It also has 2 handles, one on each side of the cart. The ATC-3S cart is similar to ATC-2S cart. Has also 2 handles, one on each side of the cart. 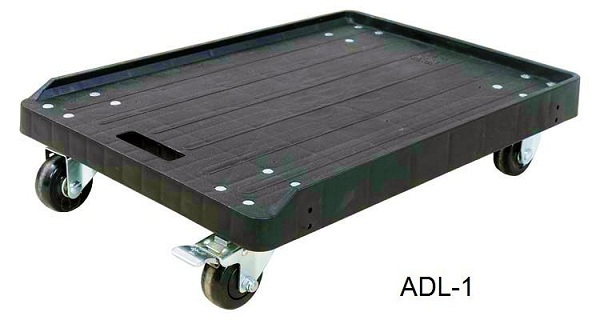 ADL-1 Container Dolly is made of strong, conductive and ware resistant high impact material. It is used to transport containers with PCB's, PCB Racks, parts etc. in ESD safe production environment. It is essential in every ESD controlled assembly area. The trolley solves limited space in factory. 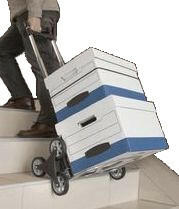 Containers can be simply piled-up the stored on the top of the trolley. Maximum number of containers piled up on top of each other should not exceed 10 pcs. Each trolley has one puller and four through ESD Casters. Two casters can rotate. This product is recommended for maintenance of ESD safe rubber wheels of all ESD Safe Carts. The rubber wheel (especially under load will collect this dust on the rolling surface of the wheels. and assure discharge of static electricity to the ESD safe surface of the floor. 2012 Copyrights BOKAR - all rights reserved.